Maurice's Blog › Happy American Thanksgiving! 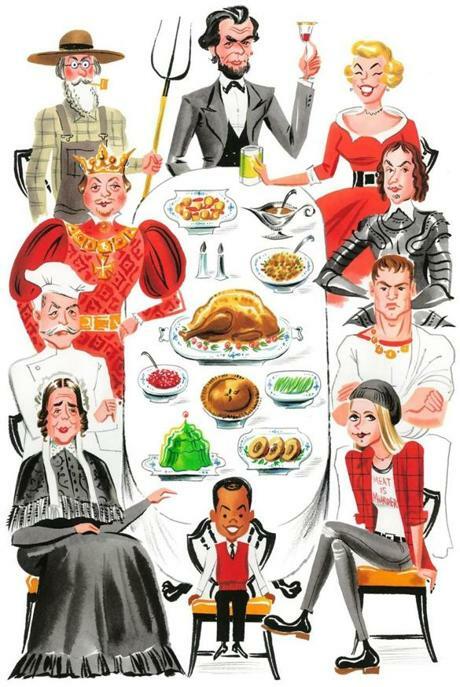 Here is a commission from The Boston Globe for an article titled, “Thanksgiving, or how to eat American politics,” by Rachel Laudan, author of “Cuisine and Empire: Cooking in World History”. Her piece traces the evolution of the ‘traditional’ turkey dinner as a kind of populist reaction against stuffy, aristocratic, European modes of dining. Sarah Josepha Hale, editor of Godey’s Lady’s Book (pictured bottom left) democratically proposed inviting children to join adults in a simple, nutritious meal that was a reaction against the fancy sauces and elaborate molded desserts beloved of monarchs across the Atlantic. It was she who persuaded Abraham Lincoln to declare Thanksgiving a national holiday 150 years ago. A very happy Thanksgiving to all my friends in the US! This was written by admin. Posted on Thursday, November 28, 2013, at 2:42 pm. Filed under Uncategorized. Bookmark the permalink. Follow comments here with the RSS feed. Comments are closed, but you can leave a trackback. ‹ The Many Faces of Glenn P.